Solidarity Halifax member Evan Coole exposes the hypocrisy in Community Services Minister Joanne Bernard’s support of the NS Liberal budget. Originally published at The Chronicle Herald. 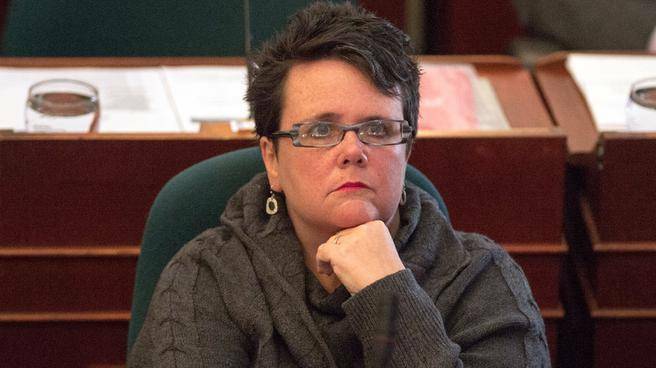 Community Services Minister Joanne Bernard should remember that her office’s “clients,” as her staffer referred to them, are also her constituents, writes Evan Coole. Photo: The Chronicle Herald. Can you imagine having to gather a mountain of documentation before sitting in front of a panel of civil servants and an adjudicator to get your child a dental procedure? How about having to check with two government employees and go through months of meetings and arbitrary tests before applying for a job or training program? I have seen this and more in my work advocating for people on social assistance, which is why I accompanied a group of Dartmouth North residents to Joanne Bernard’s MLA office to demand to know how she can support a budget that makes life worse for unemployed and disabled people. After this visit, we know her office is acutely aware of the problems, but she is choosing to support the budget anyway. Minister Bernard’s office staff informed us she routinely sees people getting denied funding for essential health needs like diabetic diets and medical equipment. She echoed our sentiments that the burden the Department of Community Services places on people who are ill and disabled to prove they are ill and disabled is unfair and onerous. Her staff also mentioned that an issue she sees frequently is people with disabilities having their rights violated by one of the many unscrupulous landlords in Dartmouth North. I would imagine this is the kind of issue People First, a self-advocacy organization for people labelled as having intellectual disabilities, would be happy to take on had their meagre funding not just been slashed by Ms. Bernard. Throwing film workers out of their jobs, cutting health care and education, freezing social assistance, deregulating tuition fees and trampling workers’ rights — there is something in this budget to make everyone unhappy. Everyone except John Risley and perhaps the other handful of billionaires in Nova Scotia. Being a billionaire in Nova Scotia entails receiving public benefits more generous than any individual on assistance would even dream of having access to — loans, tax breaks and outright handouts. I would suggest they do as Finance Minister Diana Whalen said Nova Scotia’s university students should and be willing to “pay to play.” Instead, the poor are expected to suffer further so people like Mr. Risley can continue to enjoy his wealth. While enrolled at Mount Saint Vincent University, Ms. Bernard accessed income assistance to support herself and her child while earning her degree. Because I provide legal support to people on social assistance, I can empathize with how hard she must have struggled to get by. That said, the public benefits she received in the 1990s were much more generous than what social assistance provides now. She enjoyed lower tuition than any student coming after her, and important to note is that her ministry makes it much harder to access education while on assistance than during her time. I find it hard to understand why she supported a budget that further erodes what she enjoyed herself. She should remember that her office’s “clients,” as her staffer referred to them, are also her constituents. If she won’t take a stand, I’m sure the low-income residents of Dartmouth North would be happy to find someone who will. Evan Coole is a legal aid worker. He was the founding staff organizer of Nova Scotia ACORN, an organization of low and moderate income people, and is a member of Solidarity Halifax.